It was about mid-way through the summer of 2017 when it hit me… the thought of my future. The thought that every high schooler goes through, of what they’re going to do, and what steps they should take to get from point A to point B. The planning phases. Luckily, I knew what I wanted to do. Film… it has always intrigued me, every bit of it, the story, production, or post production. I just didn’t know the step I needed to take, like many people of my age. But to my surprise, my Dad, (who knew that I wanted to go into film) had found that step for me. He told me he had some friends who owned a video company, and that I had the opportunity to be their intern. Now, as you could imagine, I was excited. It’s not common for a high schooler to get an internship. I expected to be the coffee run type of intern, but was pleasantly surprised on my first day, Luke and Brent immediately started teaching me an Adobe program, and by lunch I was helping Brent with his project. They know how to keep the work atmosphere fun but focused. Throughout my internship I’ve learned many things and been given the opportunity to do many things. One of the many things I’ve learned over this time is After Effects. A very expansive, and intimidating program at first, but that was quickly reduced after a couple of weeks of Brent’s teaching. He first taught me some simple animation skills, that I used to make a lower third. Looking back, it was terrible, and probably took a lot for Brent to tell me it looked good. After the initial introduction to After Effects, he wanted to teach me character animation, so I used Adobe Illustrator to draw the concept art for my character. The next step was to use it in a video. So I decided to make a sort of teaser trailer for Candle-man. ﻿I had to animate eight different scenes. This is where I really began to like After Effects, It was finally becoming easier and fluent, and I was able to narrow the once large scope. Though it was a long journey, I’m glad I was fortunate enough to learn this skill from Brent. Since then I have been able to apply the things I learned to tons of projects, such as lower thirds for live events, animating text and most recently a short holiday video. Through all of these I was able to lean more and more with each project. 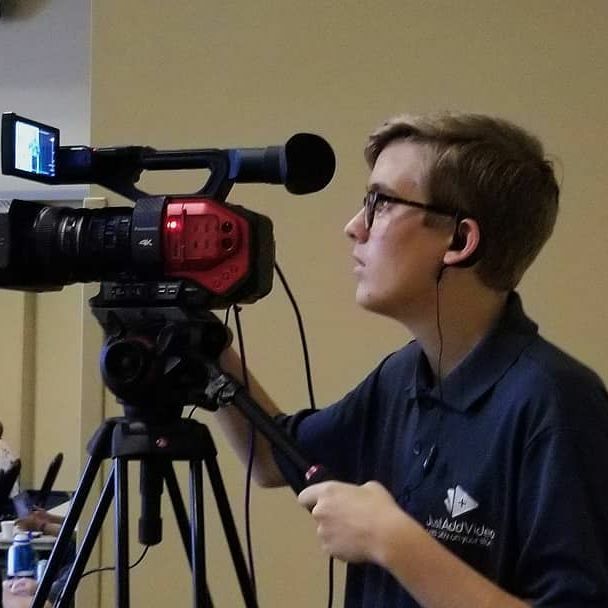 While my two years here have been a lot of After Effects, I have been taught much more, such as video editing in Premiere Pro, Camera operating in studio and for live events. Another massive part of my internship has been behind the camera. The first thing I worked on was helping Luke film these workout GIF’s for a local gym. It involved setting up a green screen and making sure it was adequately lit, in order to key out the talent in post. This was a great way to understand the basics of lighting and the workflow of a video shoot. Next, I was introduced to Premiere Pro to edit the GIF’s and key out the green screen, this really helped me get used to the editing software. Just Add Video has a client called Next After that they make various videos and content for and every year they hold and event called NIO Summit that they live stream. Little did I know that this would be my first plane ride and that they would invite me to come as a camera operator. This event was awesome experience for camera skills and getting to learn the setup of live events. Throughout the rest of the year we had a bunch of smaller live events that helped me keep on sharpening and learning. All of these experiences have really made grow in my knowledge and skills of camera operating and editing. This Internship has taught me more than I could have ever imagined, Luke and Brent are extremely talented and fantastic teachers of their craft. Now I get to look back at where I was in my knowledge and skills in Filmmaking and see how far I have come due to Just Add Video. Is it pretentious to use a quote from Benjamin Franklin? We all know that practice makes perfect, but I especially like this quote because it takes that truth to the next level. Hands-on experience is the purest way to grow our skills and understandings within our profession, and it’s this constant pursuit to learn and grow that we strive for at Just Add Video. When I was in college, many of us were rushing to intern and beef up our resumes. It’s terrifying, the thought of falling behind in a world saturated with educated and talented people. I was fortunate to land an internship at a small games company, where they needed all the extra help they could get. While my friends were running for coffee, I was getting a true second education. And that’s what an internship should be - a practical education. If you pay attention to our social media, you may already be familiar with @CalebTheIntern. Caleb, our intern, embodies everything I’ve mentioned above, always jumping at the chance to participate (whether it’s ‘fun’ or not). We asked him if he’d be interested in writing about his time interning with us, being our first intern. He’s assisted us in numerous projects since starting, including filming at events, editing, while also growing his animation and graphical skills. This article isn’t about patting ourselves on the backs for being awesome (although, pat pat) nor is it simply about recruiting other students interested in interning - mainly, we just wanted to say thanks and honor everyone who is helping us grow our company and our own skills, and give them a chance to tell their story.